Marc-Etienne McLaughlin is the champion of the largest buy-in event of the 2016 World Cup of Cards (WCC). McLaughlin shipped Event #22: $5,000 NL Hold'em 8-Max for $76,830 and captured the WCC Champions trophy, topping a field of 44 players. Day 2 began at 2 p.m. inside Playground Poker Club, the host of the 2016 WCC, with 12 of the 44 players returning. A super deep-stacked field played out for just over ten hours on Saturday before McLaughlin finished off his last opponent. Here is a look at how the final nine made out. Heads-up play lasted for just under two hours. 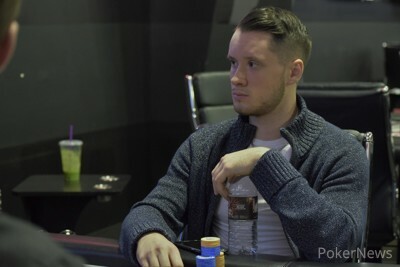 McLaughlin entered heads-up as the chip leader but Pierre-Paul Paulin quickly closed the gap. McLaughlin was able to beat Paulin back down and finally seal the deal. On the final hand, Paulin opened and McLaughlin called in the big blind. The flop came , and McLaughlin check-called a bet of 25,000 from Paulin. The fell on the turn and both players checked to the on the river. McLaughlin checked again and Paulin bet 50,000. McLaughlin check-raised all-in and Paulin went into the tank. After a moment, Paulin tossed out a chip, making the call and McLaughlin tabled , for trip threes. Paulin nodded, tossing his cards into the muck. A short-stacked Francois Goulet fell in third place when McLaughin open-shoved from the small blind into Goulet's big bling. After a moment, Goulet made the call, putting himself at risk with ten-eight of diamonds. McLaughlin held eight-five and though Goulet had McLaughlin dominated, McLaughlin rivered a straight, and Goulet was finished off. Martin Raus shoved preflop with pocket eights but ran smack into Paulin's pocket kings. Raus found no help on the board and was knocked out in fourth. Pascal Lefrancois was the first to bust in the money. Lefrancois chose a bad time to make a bluff, shoving on the flop against Goulet. Goulet, however, had flopped top-pair, top-kicker and snap-called, sending Lefrancois to the rail in fifth. Chanracy Khun was the unfortunate 'Bubble Boy', shoving preflop with ace-jack but finding McLaughlin in the big blind with pocket queens. Khun picked up a flush draw on the turn but McLaughlin was able to fade it, eliminating Khun in sixth place. Jean-Louis Cyr also ran into a big pair. Cyr moved all-in preflop with pocket tens but Goulet woke up with aces and Cyr departed in seventh. Carl Martel picked up aces in a hand against three of his opponents. Martel went all-in on a very wet flop and got looked up by Paulin, who had flopped an open-ended straight flush draw. Paulin got there on the river to crack Martel aces and bust him in eighth. Samuel Panzica was the first casualty of the final table. Panzica was also a casualty of Paulin. Both had rivered flushes but Paulin's was better and Panzica fell in ninth. The World Cup of Cards is quickly winding down, with just five events left. Congratulations to Marc-Etienne McLaughlin, and good luck to all players in the rest of the festival. PokerNews will be here throughout the festival, bringing you all the news, updates, and photos. Follow @pokernews on Twitter for live updates, Periscope broadcasts, and more. Also, follow PokerNews on Facebook and Instagram. Pierre-Paul Paulin opened for 20,000 on the button and Marc-Etienne McLaughlin called in the big blind. The flop came , and McLaughlin check-called a bet of 25,000 from Paulin. The fell on the turn and both players checked to the on the river. McLaughlin checked again and Paulin slid out a bet worth 50,000. McLaughlin check-raised all-in and Paulin went into the tank. After a moment, Paulin tossed out a chip, making the call and McLaughlin tabled , for trip threes. 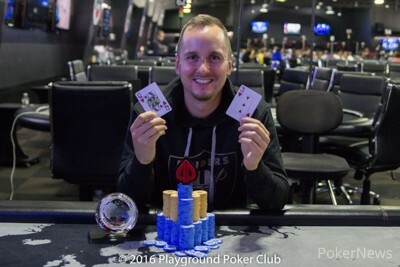 Paulin nodded, tossing his cards into the muck and McLaughlin took down the pot, the title, the trophy, and the top prize, $76,830. If you are not here and want to catch a glimpse of the action, head over to the PokerNews Facebook page for live-streaming coverage of the heads-up battle. Blinds have increased to 5k/10k with a 1k ante. Blind levels have dropped from 60 minutes to 30 minutes. Play has sped up some but both players are about even and super deep. Blinds are currently 4k/8k. 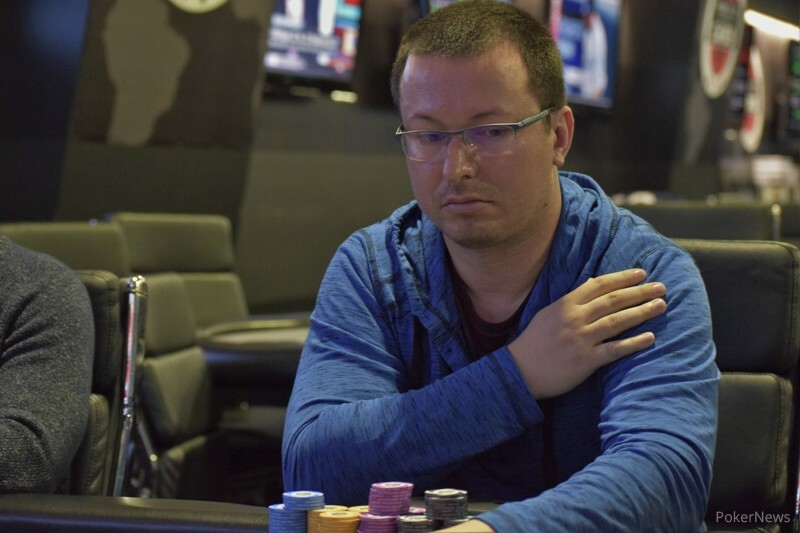 A hand after Marc-Etienne McLaughlin hero-called two barrels from Francois Goulet with queen-high and it turning out to be good, leaving Goulet short-stacked, McLaughlin shoved from the small blind and Goulet called in the big blind, putting his tournament life on the line. Goulet was ahead for the time being but needed to hold to stay alive. The board ran out , giving McLaughlin a straight and Goulet was eliminated in third. Marc-Etienne McLaughlin opened. Pierre-Paul Paulin three-bet, to 38,500 to which McLaughlin four-bet to 105,000. Paulin then five-bet to 178,500 and McLaughlin six-bet shoved all-in. Having to call for his tournament life, Paulin folded. 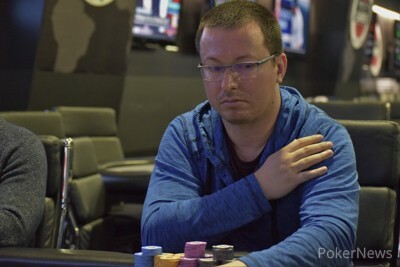 Jean-Louis Cyr Eliminated in 7th Place; Money Bubble Time!